The Find Jobs tab is used to search for jobs in the CopyStorm/Director Database. For sites with 10 or fewer jobs defined, clicking on the “Search” button will find all jobs. For sites with a lot of jobs the search criteria at the top of the page allow easy filtering of the list. Optionally fill in one or more query parameters. Once one or more jobs are found, click on a job name to load it into the Job Editor. Job Name Find jobs where the name matches the query. Use a * for a wildcard. Description Find jobs where the query text appears in the description. Use * for a wildcard. Salesforce User Find jobs where the Salesforce user matches. Use * for a wildcard. Jobs that did not run today. Jobs created in the past 7 days. Connection String Find jobs where the CopyStorm database connection string contains the query. Use * for a wildcard. 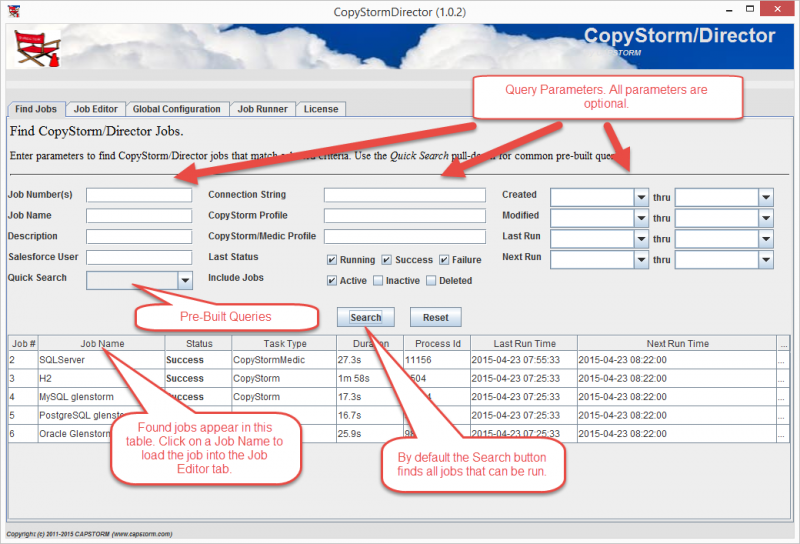 CopyStorm Profile Find jobs where the CopyStorm profile matches the query. Use * for a wildcard. CopyStorm/Medic Profile Find jobs where the CopyStorm/Medic profile matches the query. Use * for a wildcard. Running — a task defined in the job is running. Success — the last reported status of the job was success. Failure — the last reported status of the job indicated a problem. Active — the job is available to run. Inactive — the job is not available to run but has not been marked as deleted. Deleted — the job has been marked as deleted. Modified Find jobs modified within a date range. See the Created options for accepted date formats. Last Run Find jobs that ran within a date range. See the Created options for accepted date formats. Next Run Find jobs scheduled to run within a date range. See the Created options for accepted date formats. Search Run a search given the current query criteria. Reset Reset all search criteria to their default values.